We believe you will be surprised and impressed at the facilities available at Training Camp Barcelona! The photo's below will give you an idea of what there is here. All facilities can be used with your special 'Training Camp Barcelona' pass. 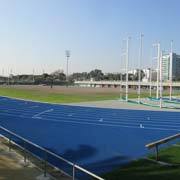 The 6 Lane recently re-laid Mondo Running Track. Jump pits and crash mats. Beach running (beach alongside track). Many athletes are now experimenting with Triathlon and indeed the facilities here are perfectly suited to Triathlon Clubs too. The Swimming pool here is amazing and brand new. An outside 50 Metre Olympic Sized pool and an indoor one too. There are also the leisure pools in the hotel and open water swims down at the beach. We know you will be as impressed with these facilities as we were! Most Athletic Clubs; Road Running Clubs; Triathlon Clubs, and Personal Trainers will have their own Coaches travelling with them. We will provide an information pack with all you need to know including track passes and a named contact at the stadium should you need to be in touch with anybody in authority.